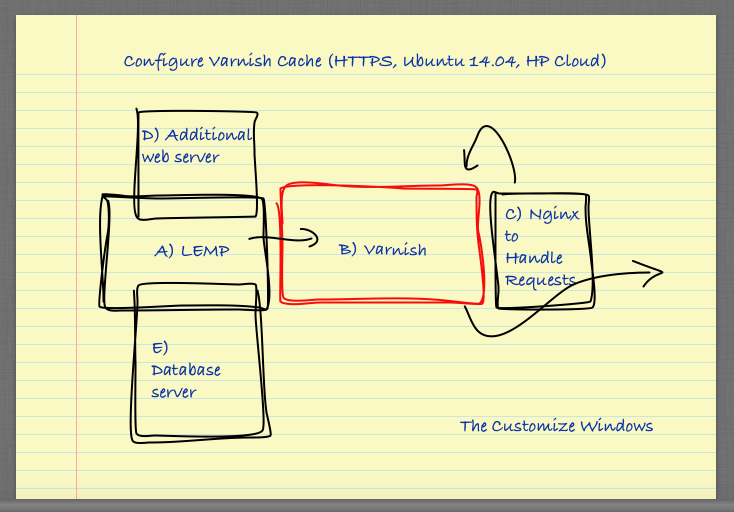 Here is how to configure Varnish Cache for a HTTPS website, running on Ubuntu 14.04 on HP Cloud. Use a dev server to get used with Varnish. Varnish Cache is notorious for throwing Guru Meditation Error. As basically it is difficult to configure Varnish Cache for HTTPS for the new users, we are writing a separate guide. We frankly do not recommend to use Varnish with HTTPS because it will not give much advantage. We are taking it granted that the reader has sufficient working knowledge on HP Cloud Specific areas like running an instance on HP Cloud and works like installing WordPress with Nginx or Apache2 web server software. This guide is HP Cloud specific. We will assume that the reader is using either GNU/Linux or OS X. windozzz users has PuTTY. The image is drawn trickily. Those are fools like me, can install everything on one server & those who are very clever like me (double role lol) can use a separate database server and other separate-separate stuffs. 10.0.0.19 is our instance’s subnet and set from hosts file. As you can see – Varnish will never give any advantage if the site is HSTS like that of us. We would tell you the same thing like Rahul Bansal (RTCamp) – “Varnish + Nginx does not worth the effort”. We use XCache for WordPress and it frankly pushes the site faster, then Akamai Caches. Our less optimized part is SSL negotiation part. Why we avoid it is a separate story. This Article Has Been Shared 1780 Times! Cloud Computing 3D Rendering Has Definite Scope in Film Industry which might alarm the Stars of tomorrow and relieve the Producers investing in the Films. Cloud Computing becomes fully enjoyable if it is arranged to make a scalable system for the application or CMS or any web software including WordPress. How Cloud Computing Challenge Networks with virtually unlimited storage and computing capacity, reduced cost and maximum flexibility and massive data traffic. Protection of Data by data loss prevention and encryption is a key element in a cloud environment.This applies to data stored on a server and transport of data. Single Sign-On (SSO) can unify the access control, even for the mobile apps, cloud computing Platforms and social networks. But what we must know about SSO? Cite this article as: Abhishek Ghosh, "Configure Varnish Cache (HTTPS, Ubuntu 14.04, HP Cloud)," in The Customize Windows, April 28, 2015, April 23, 2019, https://thecustomizewindows.com/2015/04/configure-varnish-cache-https-ubuntu-14-04-hp-cloud/.